The ASSU Senate voted last Tuesday to reconsider a funding request by Kappa Alpha Theta (Theta) for Theta Breakers, giving the sorority two days’ notice to prepare their defense. 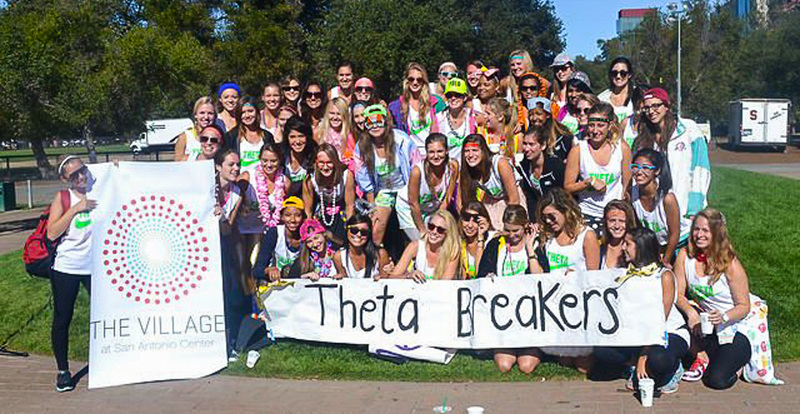 Theta Breakers is Theta’s annual 5k and 10k walk/run, which raises money for Child Advocates of Silicon Valley. On Sept. 30, the Senate approved Theta’s funding for $5,566.74 after inquiring about the nature of the philanthropy event, its fundraising efforts and its Stanford-affiliated attendance. However, the Appropriations Committee, chaired by Jackson Beard ’17, felt that the discussion during the Senate meeting was not “sufficient,” and requested the vote for reconsideration at the Oct. 7 meeting. More than 600 of Stanford’s Voluntary Student Organizations (VSOs) can apply for a share of the $351,116.70 of general fees funding this year. Special fees funding, voted on by the student body in spring elections, provides more than $2.1 million to approximately 60 VSOs. According to Senate Chair Ben Holston ’15, $1.1 million in general fees was applied for by VSOs — far more than the Senate can approve. After Beard related the Appropriations Committee’s concern about funding IFS/ISC events, the conversation opened to the public. Kimberly Bacon ’15, current Executive Vice President of ISC and former ASSU Senator and Appropriations Committee member, was the first to express her concerns about the vote reconsideration and Beard’s focus on IFC/ISC organizations as opposed to Greek organizations as a whole. In addition to discussion on proportionality of funding allocation to student organizations, there was further discussion about which types of events the ASSU should fund and which funding requests they will put on the chopping block. The resolution calls for the Senate to consider funding philanthropy events, parties and concerts “by IFC/ISC on a case by case basis using specific benchmarks.” What those “specific benchmarks” will be have not been determined yet. As for whether or not Theta’s funding should be held up by this discussion and until the establishment of benchmarks, the majority of those who voiced their concern to the Senate felt that Theta should be made the exception, not the precedent. “I think that it’s fair that after this vote, to say to the Greek and non-Greek members of the room that that is merely our previous vote but the larger conversation about future intentions and precedence setting would be the next vote,” said an ISC-member in attendance at the Senate meeting, in regards to making Theta the exception and voting again at the next meeting about the larger group. However, Holston and Senator Victoria Kalumbi expressed some reservations on making Theta the exception to the not-yet-established rule. “I think it would be unfair to make the decision on Theta without having a better understanding of how we want to approach philanthropy,” Holston said. At one point, Bacon directed her attention to the Senate, asking them to explain why the current debate was being framed as an IFC/ISC item rather than as a Greek item. In response to her question both Beard and Holston quoted figures to support their qualification of IFC/ISC and their initial exclusion of the African-American Fraternal and Sororal Association (AAFSA) and the Multicultural Greek Council (MGC) from the debate. After hearing from several ISC members and members of Kappa Alpha Theta, the Senate re-voted and unanimously passed Theta’s funding request. Senator Eric Theis ’16 broached the concept of giving the ASSU access to the financial books of sororities, fraternities and other organizations with alternative budgets. With a broader perspective of each organization’s budget, Theis believes the ASSU would be able to assess the organization’s allocation of money from other sources and would thus be in a better position to award or reject additional funding. Although the current debate surrounding funding criteria is limited to IFC/ISC affiliated groups, members of the Senate hope to expand the issue to cover the entire Greek community including AAFSA and MGC, and ultimately to other student groups as the year progresses. Tuesday, Oct. 14, at 7 p.m., the Senate will continue this debate with the hopes of establishing a criteria for allocating funds to events and what benchmarks the ASSU will require for philanthropy events, parties, concerts and for those events that fall in between. Contact Chelsey Sveinsson at svein ‘at’ stanford.edu.